Louise Elliott is a versatile presenter, bringing warmth and energy to her radio and television shows.With an honest and friendly approach, Louise has presented a wide range of live lifestyle, current affairs and consumer programmes. She is an accomplished interviewer, at ease in the company of politicians, professionals, celebrities and particularly the audience. Every weekday morning, Louise hosts a live three-hour topical magazine show on BBC Radio Wales, alongside Jamie Owen. Louise worked as a BBC network news correspondent, covering everything from politics and The Budget to the foot and mouth crisis and sailor Ellen MacArthur's triumphant homecoming. Before broadcasting, Louise spent 10-years writing for newspapers. An NCTJ qualified journalist, for years, crime and court reporting were the bread and butter of her work. She covered many high profile cases, including the Hillsborough disaster and the James Bulger murder. 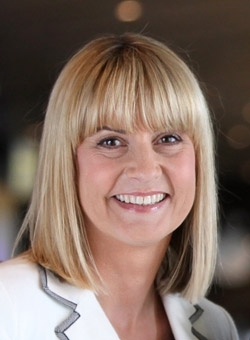 She was presenter of BBC1 Wales television show X-Ray, when the programme won a Bafta Cymru award for best magazine programme, and she earned the title of Consumer Journalist of the Year from the influential Trading Standards Institute. She was awarded the title of Young Journalist of the Year for her reports from the Bosnian war. During her career in journalism, Louise has specialised in crime, health and education issues. She presented BBC Wales' investigative current affairs series, Week In Week Out, where she researched and presented half hour documentaries on a range of issues, including professional shoplifters, missing people and murders. The daughter of a retired professional footballer, Louise is 41, mum to two girls and step-mum to another. She's a keen gardener, loves cooking and sport and has recently taken up jogging, completing two half-marathons for charity. Brought up on Anglesey, she now lives with her husband and children in Cardiff.